Implied volatility data is key in options trading. This article shows how to access free volatility data in the Tradesignal software suite. Thanks to https://www.optionstrategist.com/calculators/free-volatility-data implied volatility and IV percentile data is available. For free on a weekly basis. Using this data and the given code the data can be loaded into Tradesignal. This enables you to do your custom market scans, combining Tradesignal technical analysis and the implied volatility data from the optionstrategist website. The first step to use the optionstrategist data would be to safe it into a text file. Just copy and paste the data, no additional formatting is required. The free data on the website is updated every Saturday. After storing the data in the text file, you will have to open a scanner in Tradesignal and apply the given code. Set the scanner to load at least 250 data, as the long history is used to calculate the realized volatility. It will read the implied volatility and the IV percentile from the stored file. 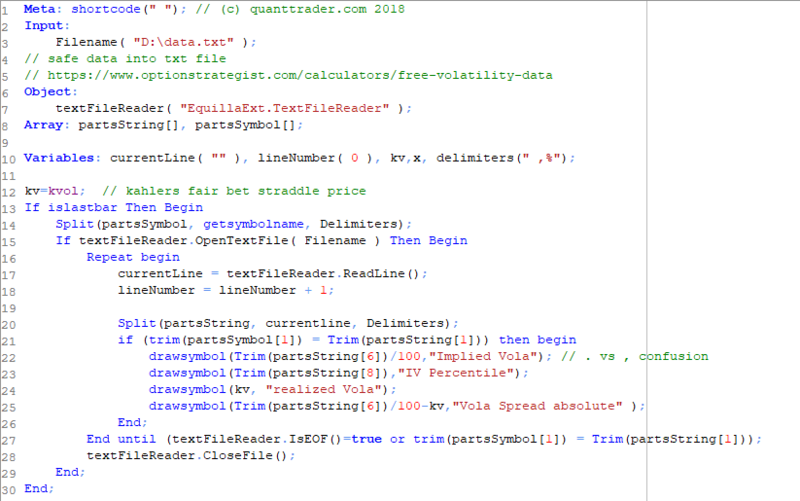 Additionally it will calculate the fair price for a straddle (realised vola) and compare implied volatility to the fair price volatility. 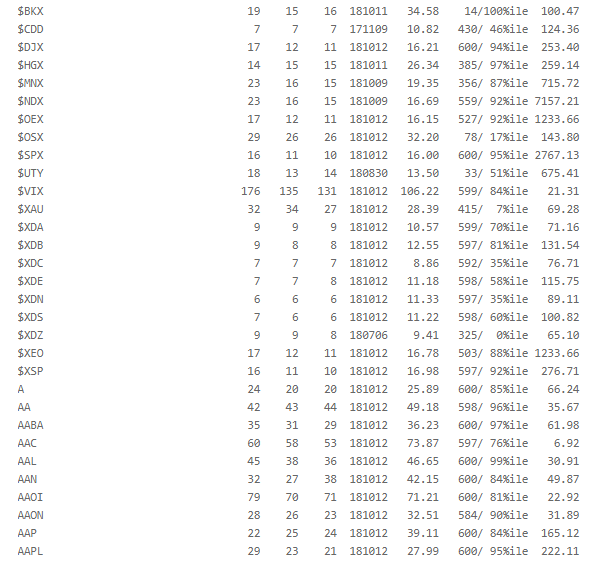 I ran a scan on the S&P500 stocks, and to reduce the list of possible trades I applied some filters to the 500 results. This reduced the 500 S&P stocks to a handful stocks. They all are traded with sufficient volume, have got a high IV percentile, the implied volatility is way higher than the fair price vola would be and they are all in a price range that fits my portfolio size. Feel free to define your own scans. With this Tradesignal code and the given free data containing all US stocks it should be easy to find the right candidate for your next trade.